Okay, so today I have the easiest of all summer boredom busters for you! It’s just good old fashioned water balloons! 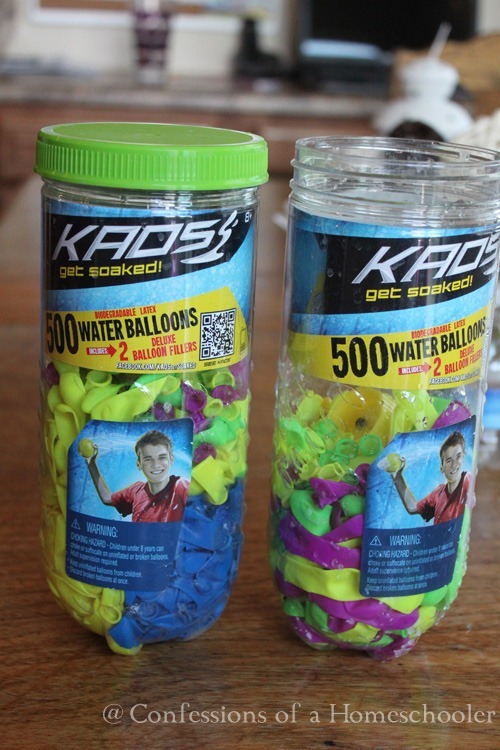 We purchased the above container of water balloons from Wal-m*rt. 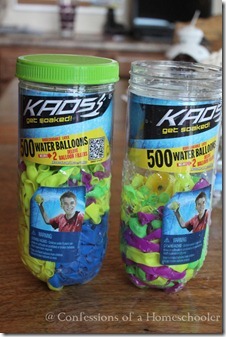 They were really cheap, and even came with a hose attachment which came in very handy for filling up balloons! 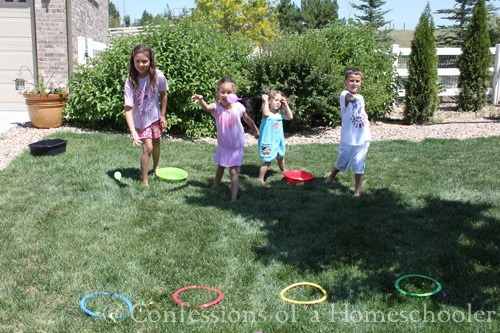 Let kiddos toss into buckets for points, or have a good old fashioned water balloon fight! 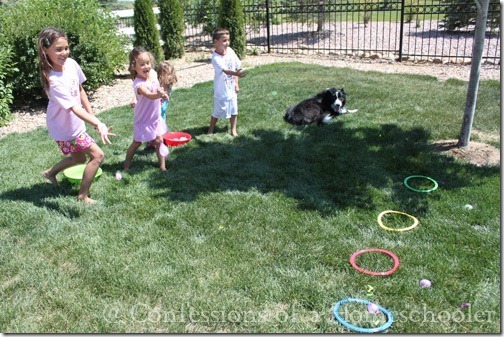 Next we set up a few games for the kiddos. 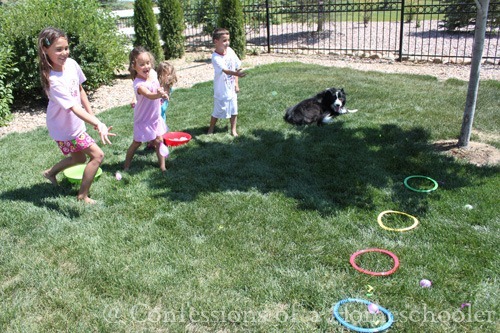 We did a balloon toss, where they got points for hitting their ring. 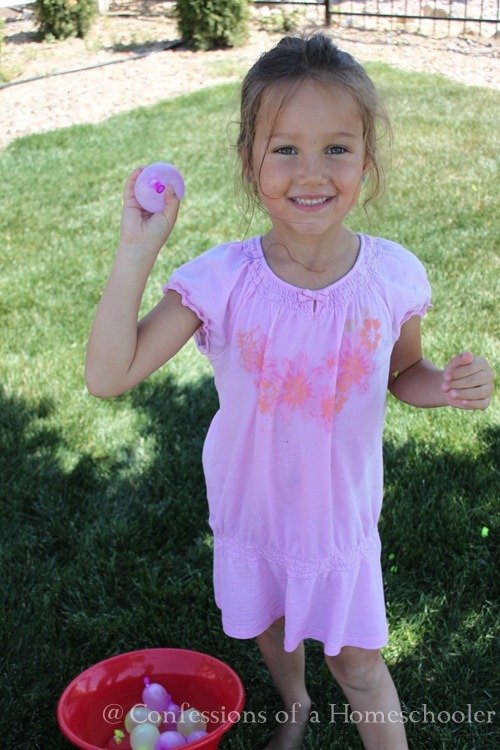 Inevitably it ended up in a good ole’ fashioned water balloon fight! Hope you have fun keeping cool this summer! Fun, my son would love this! fun! 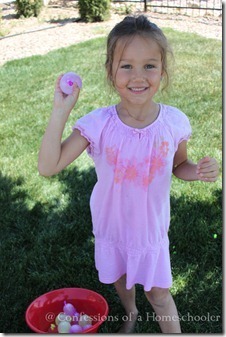 But if you’re doing water balloons you need to get a “tie-not”. We got ours from Amazon last year but I just saw them at Walmart. It’s a plastic device that helps you tie them super fast and saves your fingers from all the pain. We did over 200 for my son’s bday party this weekend very easily! Thank you for sharing this! My six year old will be thrilled that he can “tie” his own balloons!!! First I did a short feature on you today for my readers. I have been so blessed and encouraged by your blog that I wanted to share your wealth of knowledge with more homeschoolers. 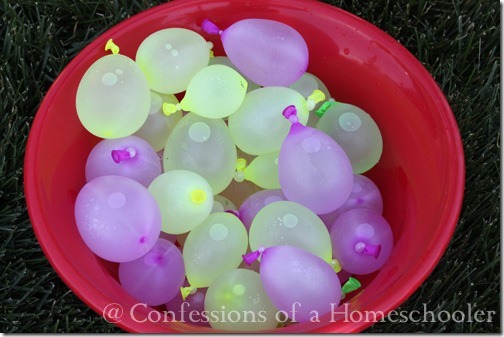 Second: Aren’t water balloons the best? I ran a VBS playstation one year in San Diego where I had to fill a literal 1,000 balloons each night for game time. My boys are still amazed that I can arm them so quickly for wter battle! Amazing article. I have been looking to fully understand this topic and be able to teach other folks. I think you have wonderful ideas here together with proven results. The question is: Is there a approach to really get all your tips here in the type of an ebook Do you have a book written on this subject The reason why Im requesting is that I dont get constant access to the internet. Therefore, a book could really help me to make consultation even when there is no access to the internet.